I attached my Nikon D300 to my microscope with some special equipment. I have to do the photography outside in the cold because the snow flakes will melt in less than 5 seconds. What is a challenge is focusing because of the different depths of field. When you put the flake on a cold glass plate slide when sitting out side, to get the beautiful crystal is difficult at times. The microscope has a built in light source which is also warm which then excellerates the flake's melt down time. What I did was to cut the microscope electric cord and inserted a cool light battery flash light . Also if you turn an air can upside down wear thick non cloth gloves-leather preferred- and that reduces the chances of getting the very cold residue spray on your hands which if not careful can cause a serious frost-bite. I placed the thin microscope glass slides on a ice cube container after I spray the ice cubes with the air can up side down. Don't recommend using those ice cubes any more after they have been sprayed with the cold residue. Throw the ice cubes away when you are done with the cubes. Be careful also with the thin glass slides. They break very easy. The flakes-minimal amount-are placed on the glass slide outside on the microscope table. But first lay outside the glass slide pieces where the snow flake can land, then transport the snow flake over to the microscope table . Remember the depth of field(focused) is a problem because of the melt down time is fast. Have EVERYTHING ready to photograph with the attached camera to your microscope. Also it is important to remember that the flakes are very small-microscopic in size. Getting good detail and clarity is important. What is interesting is, how does this flake create such a beautiful design ? It does not have a brain. This is where the Creator-God- comes into play. Snow flakes are countless.. NO 2 flakes are a like has been said but this would be humanly impossible to prove. 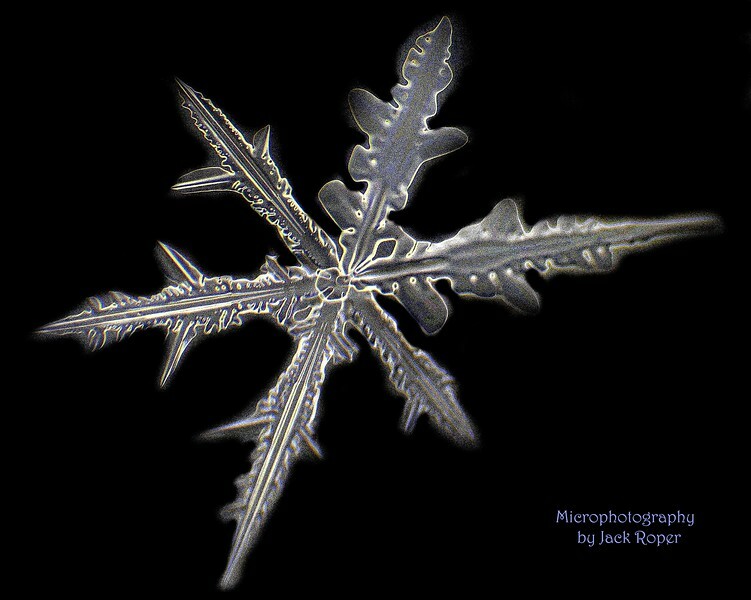 The photographer would have to analyze every dropped snow flake on Earth at the same time before they melt under the microscope light. This is where the Creator again comes into play. Only the all knowing God knows if there are no snow flakes alike. God is the greatest artist that ever existed. He is a MASTER IN EVERY THING HE HAS DONE AND IN EVERYTHING HE WILL DO !